My guys beg for these on Saturday & Sunday mornings because they are that good! 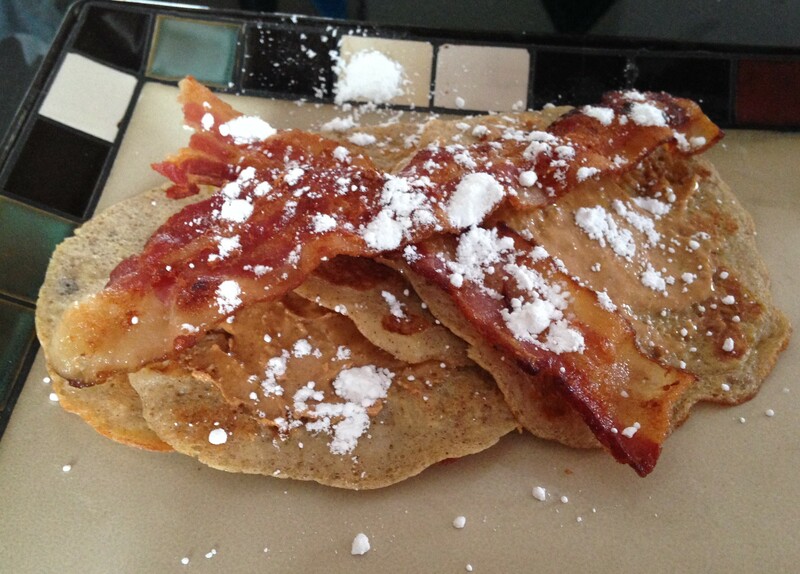 They are super thin, almost crepe like consistency so you can get creative and fill them with ingredients like a tsp of almond butter and bacon topped with powdered sugar or maple syrup. Mmmmm, they taste too bad to be good for ya! Here’s the original, flourless recipe, but I ended up adding 1/4cup tapioca flour to the batch I made on Sunday and they cooked up a little better. You can add any nut flour to this recipe to stay inline with the paleo diet. Mash bananas then mix the rest of the ingredients and cook on a skillet (I used 1/2 tsp for a little help to keep the pancakes from sticking to the pan) for about 2min on each side.